Sébastien graduated with his PhD in 2002 from the University of Warwick, England, in polymer chemistry. After one year as a postdoctoral fellow at the University of New South Wales, Australia, he was appointed as lecturer at the University of Leeds, UK. In October 2007, he moved to the University of Sydney and was appointed as director of the Key Centre for Polymers & Colloids. Sébastien leads a team of 15-20 researchers working on the design of a wide range of state-of-the-art functional polymeric materials by careful manipulation of their molecular structure. He is a member of the editorial boards of the journals Soft Matter, Macromolecules, European Polymer Journal and Polymer Chemistry, a member of the RACI Polymer Division executive committee (2011 Chair), and was appointed on the Australian Research Council College of Experts in 2011. Awards include the Macro Group UK Young Researcher Award (2006), the Young Tall Poppy Science Award (2009), the Rennie Memorial Medal (2009), the David Sangster Polymer Science and Technology Award (2009), the Le Fèvre Memorial Prize (2013) and the RS Wolfson Award (2014). Joaquin Sanchis-Martinez graduated in Chemistry from the University of Valencia (Spain) and obtained his PhD in Organic Chemistry in 2005 in the group of Prof. Ana Costero in the same University. After his doctoral degree, he held a contract research position at BASF AG (Ludwigshafen, Germany). In 2006, he joined Max-Planck-Institut für Kohlenforschung (Mülheim and der Ruhr, Germany) as a post-doctoral researcher in the group of Prof. Manfred Reetz, focusing on Biocatalysis and Enzyme Engineering by directed evolution. In 2009, he started developing polymer-drug conjugate nanomedicines with application in the treatment of cancer at the Prof. Maria Vicent’s Polymer Therapeutics Lab in the Biomedical Research Center Principe Felipe (CIPF) in Valencia (Spain). In the same year, he visited Prof. Carlos Barbas III in The Scripps Research Institute (La Jolla, CA, US) for a 3-month training period in the synthesis and characterization of Zinc Fingers. In 2011, he combined his position at CIPF with a part-time associate lecturer appointment at the Faculty of Chemistry in the University of Valencia. In 2014 he joined the group of Prof. Sébastien Perrier as a Research Fellow and is now involved in the University of Warwick – Monash University alliance, leading Prof. Perrier’s research team in Melbourne. His research interest focuses in the application of functionalized tubular structures as carriers for drug-delivery to selective tissues or biological compartments in the human body. Qiao Song obtained his bachelor degree from the Department of Chemical Engineering in Tsinghua University (China) in 2012. In the same year, he started his PhD research in the Department of Chemistry in the same university, under the supervision of Prof Xi Zhang, working on the fabrication of supramolecular polymers and polymeric materials based on supramonomer, as well as supramolecular radicals. 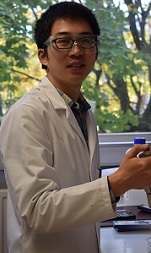 After he obtained his PhD in 2017, Qiao joined the Perrier group as a postdoctoral research fellow to study the self-assembling behaviour and biomedical application of cyclic peptide – polymer conjugates. Jie Yang received his Bachelor of Applied Chemistry from Hefei University of Technology (China) in 2012. Then he joined the supramolecular chemistry research group at Zhejiang University (China) and obtained his PhD under the supervision of Prof. Feihe Huang, working on the construction of functional supramolecular amphiphiles and novel supramolecular polymeric materials. 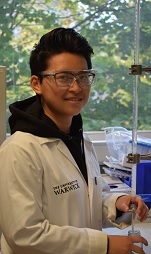 In 2017, Jie started a two years postdoctoral fellow position in Prof. Sébastien Perrier’s research group at the University of Warwick, under a Marie Curie Fellowship Scheme, to study the stimuli responsive tubular supramolecular polymer brushes aiming for biomedical applications. Fannie completed her MSc at CPE Lyon and université Claude Bernard Lyon 1 in 2017. Specialized in polymer chemistry and materials, she did her master project at c2p2 under the supervision of Dr Murie Lansalot and Franck D'Agosto and investigated RAFT polymerization of vinyl acetate and application to polymerization-induced self-assembly. In October 2017 she started her PhD at University of Warwick under the supervision of Prof. Sebastien Perrier, investigating functional polymers for RNA delivery. Sean completed his MSc in Chemistry in 2016 at Chimie ParisTech with a specialization in Medicinal chemistry and Molecular Pharmacology at the School of Pharmacy of Université Paris Descartes (France). His first research project was dealing with the synthesis of reducible polymeric structures for vaccine delivery. He carried it out at the CSIRO in Melbourne (Australia), under the supervision of Dr. Almar Postma. He then had the opportunity to do research at the Servier laboratories in Croissy-sur-Seine (France) on the synthesis of an anti-cancer drug. 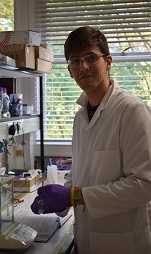 He recently started his PhD at the University of Warwick under the supervision of Prof. Sébastien Perrier, where he is working on the design of cyclic peptide-polymer nanotubes for drug delivery purposes. Thomas graduated from the University of Warwick in 2016, with a degree in Chemistry with Industrial Experience. 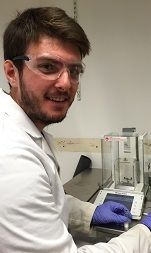 His MChem project was carried out under the supervision of Professor Sébastien Perrier, where he investigated the synthesis of hyperstar polymers. During his undergraduate degree, Thomas also undertook research projects under the supervision of Professor Rachel O’Reilly (University of Warwick) and Professor Marcus Wilhelmsson (Chalmers University of Technology). After graduating, Thomas joined the company Interface Polymers, where he worked for a year developing the scale-up processes of a polyolefin block copolymer synthesis. Thomas’ PhD will focus on the development of complex architectures of poly(2-oxazoline)-co-poly(ethylenimine) for use in non-viral gene transfection. Ramon Garcia Maset completed his bachelor degree in Biochemistry and Biomedical Sciences at the University of Valencia, Spain. He performed additional internships while attending to his degree in the Pharmacodynamics and Microbiology departments. 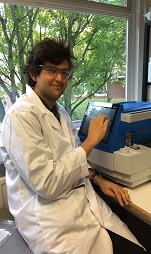 He decided to improve his knowledge of next-generation sequencing and microbiology infection so he did an internship at the University of East Anglia, Norwich, under the supervision of the Dr Justin O'Grady (Senior Lecturer in Microbiology at Medical School UEA) and the Professor John Wain, and he worked on a project in collaboration with Grifols and the University of East Anglia to develop a point of care diagnose method to reduce the diagnose turnaround time of patients suffering from sepsis, pneumonia and urinary tract infections. He coursed IBR master funded by the MRC DTP at Warwick University where he widely increased his interdisciplinary knowledge about biosciences. 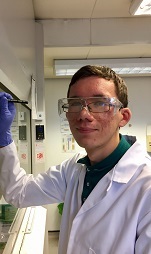 He recently started his PhD under the supervision of Professor Sebastien Perrier and Dr Freya Harrison, an interdisciplinary approach in polymer chemistry and microbiology to exploit antimicrobial agents against biofilms. 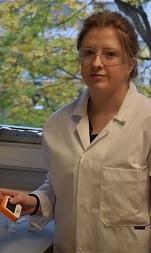 Satu graduated with MSc in Polymer Chemistry from the University of Helsinki in November 2017. She carried out her Master’s project under the supervision of Professor Heikki Tenhu, while also working as a research assistant in the Polymers and Colloids research group. The subject of her thesis was polymerization-induced self-assembly via RAFT aqueous emulsion polymerization, and the project involved the development and investigation of a new PISA formulation. In January 2018, she began her PhD in the Perrier group, studying the synthesis and properties of brush polymers for Lubrizol. 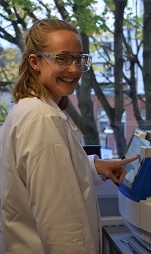 Sophie graduated from the University of Manchester with a degree in Chemistry with Medicinal Chemistry (MChem) in 2018. Her Masters project was completed under the supervision of Dr Simon Webb and investigated self assembly of sulphur based lipids for examination of prebiotic evolutionary concepts. 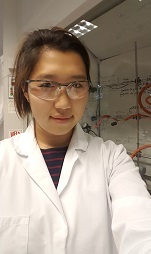 She recently started her PhD under the supervision of Professor Sebastien Perrier on a collaborative project with AstraZeneca, focusing on cyclic peptide-polymer conjugates and their applications for drug delivery. Having completed a Forensic Science BSc degree at Keele University, Maria joined the University of Warwick in 2017 to pursue an MSc in Analytical Sciences. 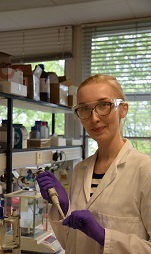 Under the supervision of Sebastien Perrier, she started her research project aimed at systematically characterising self-assembled cyclic peptide-polymer conjugates. Chromatographic and light scattering techniques were employed to monitor the effects of sample treatments to the stability of the conjugates. 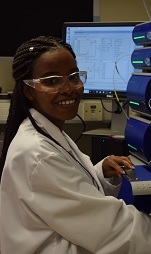 She then shortly after began her PhD (Oct 2018) where she will continue to focus on the characterisation of the conjugates using softer techniques (Field Flow Fractionation) so as to gain more information on their assembly mechanisms. 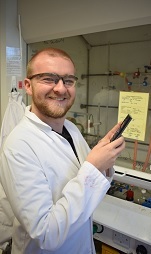 Andrew completed his MChem at the University of York in 2014. His Masters Research project was carried out at Bayer Cropscience in Frankfurt, Germany under the supervision of Dr. Stephen Lindell. He investigated cycloaddition chemistry in the synthesis of herbicides. In March 2015 he began his PhD at the University of Warwick under the supervision of Prof. Sébastien Perrier. 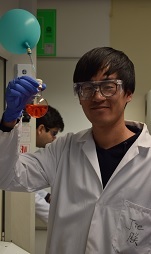 His project is sponsored by Lubrizol and investigates the synthesis of brush polymers. Agnes completed her MSc at Chimie ParisTech in 2015. For her Masters project, she investigated the synthesis and the self-assembly of amphiphilic copolymers for drug delivery under the supervision of Dr. Paul Wilson and Prof. Sebastien Perrier. 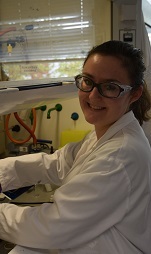 She started her PhD under the supervision of Prof. Sebastien Perrier in October 2015 and her project focuses on antimicrobial peptides mimicking polymers in collaboration with the CSIRO. Andrew started his undergraduate degree in 2008 at the Liverpool School of Pharmacy (LJMU), graduating with a 1st class degree in Pharmacy (MPharm) in 2012. His Master’s thesis was completed under the supervision of Dr Elsie Gaskell and was on the subject of antibiotic binding and release on clay minerals for use in wound care. He then went on to complete his professional qualification as a pharmacist at Imperial College Hospital, London, qualifying in 2013. After a short period practicing as a pharmacist, in 2014 he came to the University of Warwick to study for a postgraduate MSc in chemistry with scientific writing, completing a research project into the synthesis of glyco-polymer particles and graduating with distinction. 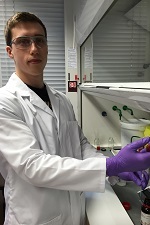 He is now continuing his wok into glyco-polymer particles and their pharmaceutical applications at the University of Warwick, under the supervision of Sébastien Perrier. Maryam holds an MPharm degree in Pharmacy from Amman Ahliyah University, Amman, Jordan as the highest score graduate with distinction. Afterwards she served in community pharmacy until 2014, when she started her MSc course in Pharmacology and graduated in 2015 from the University of Brighton, with distinction. Maryam has joined our group in October 2018. Her current PhD research, sponsored by the Chancellor's international scholarship, is focused on Cancer chronotherapy and nanomedicine. Julia completed her MChem at University of Warwick in 2015. Her masters project, under the supervision of Prof. Sébastien Perrier, looks at the further modification of Janus cyclic peptides that have been previously studied in the Perrier group. She also studied under Professor Hongyu Chen at Nanyang Technological University for her international placement in 2014. The project focussed on optoelectronic organic charge transfer complexes that form uniform microtubes.In September 2015, Julia began her PhD under the supervision of Prof. Sébastien Perrier focussing her research on cyclic peptide polymer conjugates. Robert graduated with a 1st class degree in Chemistry (Mchem) at the University of Warwick in 2017. His Master’s thesis, under the supervision of Sébastien Perrier, focused on the preparation of pH responsive polymer nanoparticles for targeted drug release. Robert began his PhD under the supervision of Sébastien Perrier focusing on RAFT emulsion polymerisation. 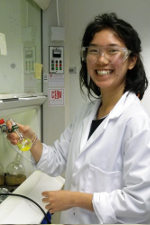 Ting is a final year MChem undergraduate currently working on her Masters project under the supervision of Prof. Sebastien Perrier and Fannie Burgevin. Her project involves the synthesis of degradable copolymers using vinyl monomers and MPDL. The degradability of the copolymers would be tested via hydrolytic degradation. 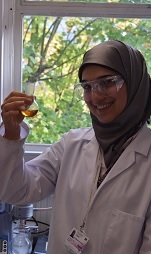 Leila is undertaking her MChem research project within the Perrier group. 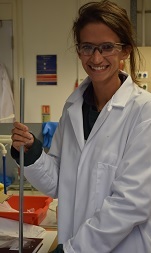 She is currently completing her Master’s degree in Chemistry at the University of Warwick and has previously conducted a URSS summer project with Dr Gemma Davies on responsive contrast agents for MRI. Her MChem project is about varying the structure of cyclic peptides and functionalising them with polymers in order to assess how the peptide structure affects their self-assembly. Sophie is a master’s student at Humboldt University, Berlin where she also completed her bachelor’s degree (collagen mimetic peptide synthesis under the supervision of Dr. Hans Boerner) in December 2017. Sophie joined the Perrier group in October 2018, with her project focusing on emulsion polymerisations by free radical and RAFT.